..Yet I still kind of like it. I was looking at this gem over at Quite Polished - and loved it! I was going to give the whole black and white activity a whirl, but I had a newly acquired Butter London polish calling my name.. So I used that instead. Now, I failed because.. Well, because I just did. This should really be called 'Dots', but I can do that any time.. So it is a stippling fail without the regrets! Some day I will try this again.. And I will have better results. And, again, I just have to say how much I freaking LOVE Butter London polish.. Everything about them (to me) is perfection. I just had to toss that out there again.. If anyone has ever considered buying them but are kind of put off by the price: they are totally and completely worth it. And no, I'm not sponsored in any way, shape, or form to say this. I'm just telling you all what I think about them.. Or feel.. And that is love. Until next time, take care!! 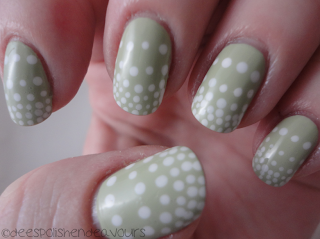 I like it :) thats a pretty Butter London too! You may see it as a stippling fail, but I see a dotting WIN! !